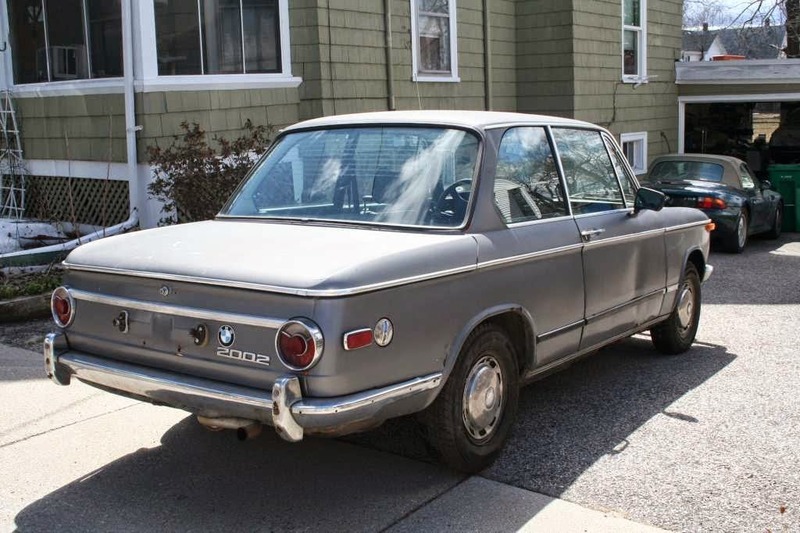 I've never been a big fan of any classic car with structural rust, regardless of price, but this next feature comes with an interesting back story because it is being listed as a seller submission by Rob "The Hack Mechanic" Siegel who is known for his BMW Roundel Columns. 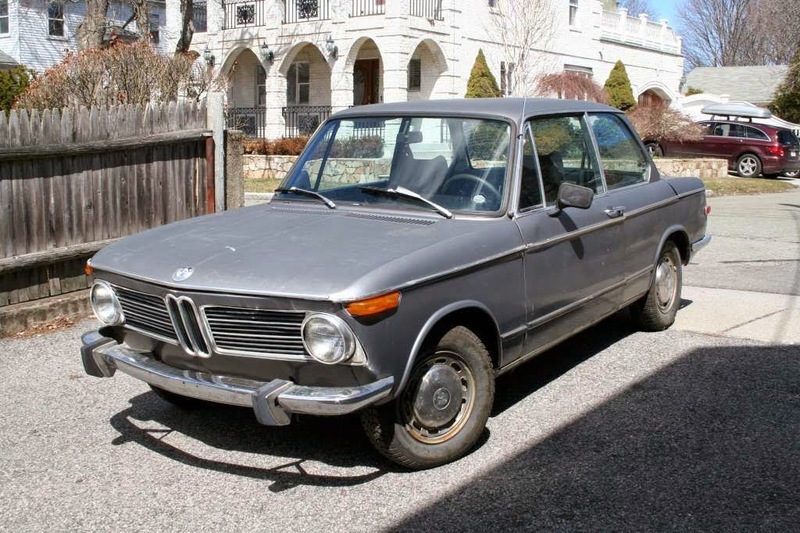 Find this 1973 BMW 2002 offered here on eBay currently bidding for $685 with 1 day to go. The BMW 2002 was the high end of the BMW Neue Klasse (new class) platform, equipped with 2 liter inline-4 and is a regular on the Daily Turismo because they are fantastic to drive, useable and inexpensive today. The little 2002 is a great starter car and offers plenty of simple mechanical work for a young hack mechanic in training. 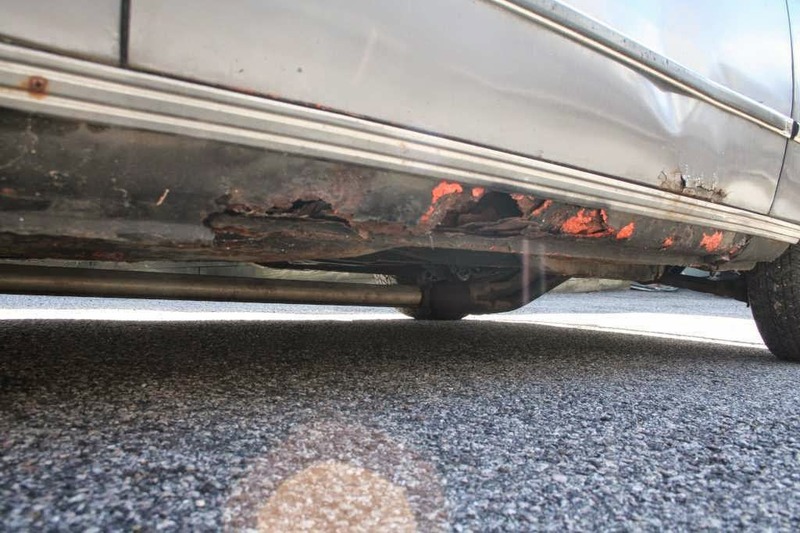 This one has some seriously nasty looking salt-belt rust, but I'm not one to suggest it is unsafe or un-road worthy...but if you are going to buy it, you'd better have serious metal fab skills, or a "drive it till it dies and leave it on the side of the road" attitude. Swap in a two-stroke and it would be perfect. And a huge wing. Add that. All you need are a couple of street signs and a rivet gun to make this a good driver. Street signs.... hmmm... good idea, in the past I've used cookie sheets. Better to cut big chunks out of the hood or roof of a Suburban or something like that. Street signs around here are heavy-gauge aluminum, which means bimetallic corrosion in a steel car. The cookie sheets are just too small. 18ga sheet steel is cheap at the local metal yard. The street sign aluminum is worth more just on resale, just don't sell it to someone who's going to have the cops asking where you got it. a) I like the pre-bumper '02s. c) I've got a rotisserie that'd fit this thing beautifully. c) Car's way the hell over there and I'm way the hell over here. 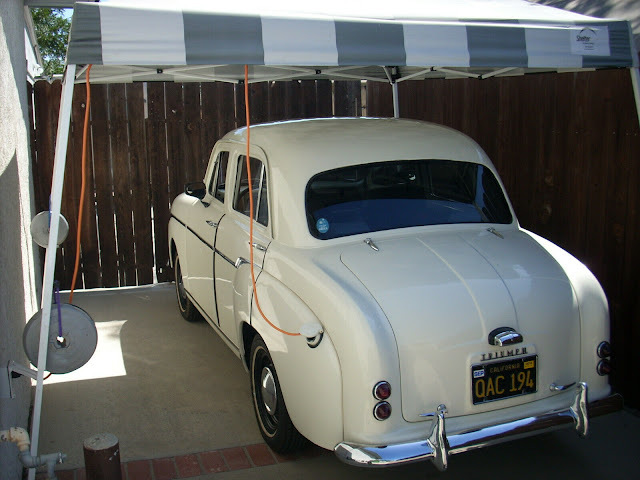 If you haven't read Rob's book "Memiors of a Hack Mechanic" I highly recommend it. Almost as good as the Peter Egan books containing collections of his Rodent Track and Psycho World columns. Haven't read it yet. Will! DT book club? Did you get a chance to check out that Element, G? Unfortunately they didn't have it anymore. We are going to look at Subaru and Mazda today. I will report back on the other post her impressions. Uh oh. Spiegel is a roundelatic. Are you sure I'm going to like it? I think you will like it. I did, and I'm an Alfista! I will second the recommendation. K2, what did you think of the book? Hey guys. Thanks for the comments. Street signs. Great idea! What the?!? Are you Spiegel? Looks like you are! Welcome to DT! Or , if you've been lurking, welcome back! Looking forward to reading your book. I'd imagine that a person might be in a tough position as the author of a book like Mr. Spiegel's. Folks might think you know everything about BMWs and maybe even cars in general, to the point where it would be uncomfortable just shooting the breeze on the general subject. Making even the tiniest factual error could cause readers to jump down your throat. If your book is really focused on what your experience was/is, that doesn't necessarily mean you're an expert outside of that (but you would be on what you wrote about, of course - because you wrote it!). The book I wrote was on such a niche field, that it's hard not to be an "expert", but I still get people coming up to me and trying to stump me on the subject. It's absolutely possible even given the narrow field - but it's still difficult nonetheless. I'd love to hear Mr. Spiegel's take on whether he's uncomfortable or not participating in online forums like DT. Shhhh K2, he barely comes around enough as it is....don't scare him off with rapidfire multi-posts. It would seem your Bimmerphobia may have you unfamiliar with Rob----he IS an expert (and a helluva nice guy too). I'm sure he is and I'd love it if he'd de-lurking. We need more people like him on DT. Maybe I'll even change my mind about BMWs! Sure. Plus, I'm sure he's no delicate flower and can speak for himself. In the meantime I have to finish these books before I can dig into his, which I'm looking forward to. I enjoyed reading his blog, BTW. Well worth reading, especially the bit about the Kennedy bomb shelter. AND asking me to not ask questions...is like asking me to chop off my own arm. But I hear you FTB. Still, I'm not going to do it even though I know your heart is in the right place.